Every Friday, writers from around the globe join to write tiny tales in response to a photo prompt posted on Rochelle’s blog. This week’s photo has been supplied by Rich Voza. 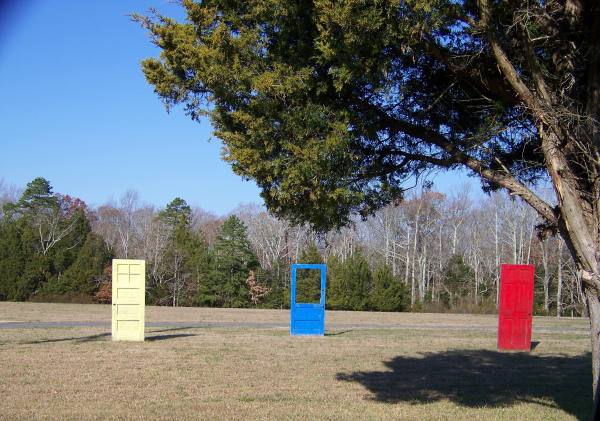 Simon and Patch paused abruptly at the strange sight: three doors, red, white and blue, lonely statues beyond the oak. Patch growled, his hackles rising like hedgehog spines. Every hair on Simon’s body stood to attention. The handle on the red door turned. Patch whined, dropped to the ground. The door creaked open, icy air hissing through from whatever lay beyond. Simon stumbled, currents of cold air folding around him, binding him, dragging him towards the doorway. Patch barked. He leapt into the vague shadows, snapping, tearing, twisting, retrieving his beloved master. The door slammed hastily closed. No victim today. In memory of loyal dogs everywhere. Rest in peace, Snoop. Which colour shirt or socks today? What shoes to match, denim or cord? How far will it spread from red, white or the blue? Our free ebook, available for Kindle and other e-readers. Glad you liked it, Dawn! Loved them both but I’m a sucker for a dog story, beautifully written. And very eerie. Thanks, Sandra. It was a good way to honour Snoop (a Shar-Pei) whom my family lost earlier in the week. I echo Sandra. The dog story is great. Asking me about poetry is like asking a fish about a tree. Thanks, Doug! Yes, I kind of agree with your fish and tree comment. Sometimes what I have to say comes through better as poetry, but I don’t often inflict those creations on anyone else – still very much a newbie! I Love the dog story. My vote goes to Joanna. What a compelling image ~ the three doors! ~ and great story. Reminds me of three colours ~ just wondering whether this was the Red, White or Blue instalment (prob-ab-ly RED, methinks), and whether there’ll be any more? None planned, Nicky! Actually, my first thought on seeing the image was a scene that we’ve written for Mosaic of Light – but I couldn’t use that in 100 words! I like the idea of a sequence of stories for the blog, though, and that’s something I’ve been wondering about trying.